While routine oil analysis is the cornerstone to all condition based monitoring (CBM) programs, the resulting data is not always leveraged into meaningful information. Here are four simple ways to leverage this data and make your program more effective. 1. Supply new oil samples for all oil brands annually. Many test results are meaningless without accurate baseline values from new oil samples. For example, in a recent visit to one of the largest chemical producers, the user had me look at the antioxidant values for the steam turbine lubricant as measured by the RULER (ASTM D6971) test. The values were listed at 220% and 150% for Amine and Phenol, respectively. Since you cannot be above 100% unless different oil was added, the reference sample being used was incorrect. While the lab should have flagged this for follow-up, it was not. The user reported these values had been like this for years and, therefore, the data had been meaningless. Once the test method was explained, it was apparent that the incorrect baseline oil was being used and that a new oil sample for this unit had not been supplied. 2. Establish normal benchmarks for your application and oil type, so that abnormal values can be flagged. Many commercial oil labs deal with large numbers of samples such that a professional tribologist does not look at the results. The comments are typically auto-generated and referenced to lab benchmarks that may not be appropriate for the end user’s application or machine. It is critical to understand the normal operating range of your lubricants so you can flag deviations according to your own benchmarks. 3. Calculate the year-over-year changes in key oxidation related tests. The ASTM tests RULER, RPVOT, and FTIR are essentially reporting historical oxidation or its inverse. For example, a Frame 7EA gas turbine using a particular brand of lubricant should have the same year-over-year change as another identical unit operating with the same oil. You can use this data to predict when an oil change is expected to occur years before it is required or to compare the performance of one lubricant brand over another. 4. Add specialised testing for super-critical applications that will identify and prioritise problem areas. Routine Electro Hydraulic Control (EHC) fluid testing results are often measuring less than 10% of the contamination in the fluid. Furthermore, the contamination that causes servo-valve sticking is not usually measured. 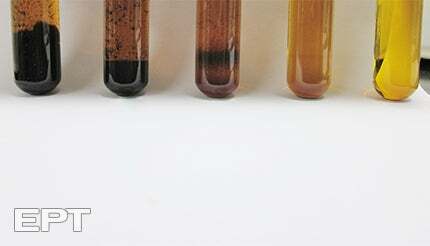 In the photo above, non-standard testing is able to pull soluble contamination out of solution. This contamination is harmful to servo valves.